Following the Tudor style for design is this English Tudor mantel carved from travertine. Fireplace pictured in Antique Beige Travertine. Available for delivery in 1-3 weeks. A very rustic aged feel for this surround. A peaked fire box opening. In stock and on sale ready to ship for a low cost. 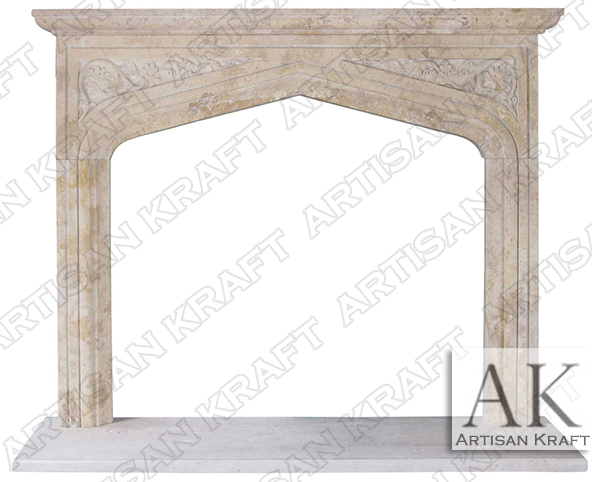 Artisan Kraft offers a wide range of Gothic and Tudor style fireplace mantel surrounds. They can be viewed here on our website or in person at our Chicago showroom. Comes with the hearth and inner panels that surround the firebox.